This past weekend was Grand Prix Indianapolis. Along with Corey Murphy—co-host of the Card Knock Life podcast—I made the four and a half hour drive from Milwaukee to compete in my very first GP. Despite both of us being long-time players who take a Spikey approach to the game, for some reason we just never made the decision to get off our asses for a GP. That is, however, until almost on a whim I pinged Corey about the possibility a few months ago. It was at that moment we realized that we had both wanted to attend one for quite some time, but never thought to ask each other. While we were of course both excited and nervous to compete in the main event, I think it’s accurate to say that we were most looking forward to spending a weekend immersed in our favorite game. For us, GP Indianapolis was more of a vacation in a new city, surrounded by people who love Magic: the Gathering at least as much as we do. We certainly gave Day 1 our all, and learned a lot as we reluctantly scrubbed out. But it’s not a stretch to say we were eager and ready to hop back into side events as soon as possible. While Corey was cleaning house in Modern Challenges, I opted instead to keep it limited. At the top of my checklist for my GP experience was a format I rarely get the opportunity to play: Chaos Draft. It may be silly, but I have always loved the challenge of sitting down to a pod where no one has much of a plan, and seeing where the packs take you. It was with no hesitation, then, that I signed up for the first on-demand Chaos Draft I could. My prefered way to Chaos Draft involves each player bringing their choice of packs to the pod, but for obvious reasons, that’s not entirely feasible or profitable for an on-demand event in a convention-style environment. And for $20 including prize support, I couldn’t expect too much. The judge held out a sack of boosters; here’s what I grabbed at random, and the order I opened them. As you can see, I picked Shadows over Innistrad, Aether Revolt and Born of the Gods. Not too exciting… but that’s about how it went for the entire pod. For me, this is where the fun and challenge of Chaos Draft starts. One obvious way to approach this kind of draft is to look for impactful creatures, preferably with a big body. Unlike a designed draft environment, Chaos Draft is likely to durdle along until one player rips a threat the other simply can not deal with. It’s also a format where you hope for incidental synergy at best. You are more likely to end up with a handful of cards that actually work well together, so bodies can be important. Prior to this draft, I had a lot of experience with Aether Revolt limited, but almost none with Shadows over Innistrad or Born of the Gods. I used this to inform my strategy for pack order, opting to open Shadows over Innistrad, where I’d hope to pull an Archangel Avacyn, Westvale Abbey, or a planeswalker. These are impactful cards that could inform my first pick down the line in Aether Revolt, a set where I have much more experience evaluating cards. Finally, I’d open Born of the Gods last, where I’d hope to pull fixing of any kind, a splashable god, or Bestow creatures to fill things out a bit. With pack order sorted, let’s cut to the chase and take a look at the deck I ended up putting together. Then, we’ll discuss how I ended up there. Pack 1 Pick 1 was a bust with nothing exciting to push me toward any particular color. In the absence of obvious bombs, I snagged Brain in a Jar. Chaos Draft is usually a slower format, and at the very worst, the Jar could keep me color neutral while getting some incidental Scry value. It was not unreasonable to cast a spell or two for cheap and dig my way to an answer once my opponent got into top-deck mode. For the rest of Pack 1, I opted for creatures with evasion and spells that interacted with the board. They weren’t necessarily big bodies, but if the game goes long, any body with flying or unblockable adds up. I was able to cut blue almost entirely, and getting passed both Magma Jet and Magma Spray in the first pack put me firmly in a spells deck. 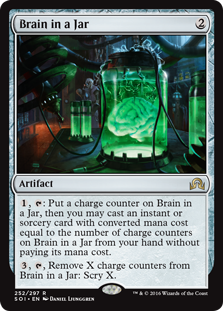 On top of that, it actually gave me something to cast with Brain in a Jar. Perhaps most importantly, however, I was able to pick up an early Temur Charm, a clear reason to splash if I ended up in two of the card’s colors. As it turns out, most creatures in this Chaos Draft had power 3 or less. Pack 2 Pick 1 was a relatively easy Disallow. At this point, I was definitely in blue as a primary color, and getting to stop my opponent’s bomb seemed like a good way to break through their strategy. The rest of the pack paid off with a good amount of blue coming my way, though not many creatures. By the second or third pick in Pack 2, it was obvious that I would be in trouble if I couldn’t get some significant bodies to hold down the battlefield. Thankfully, however, it was also obvious that green was wide open. 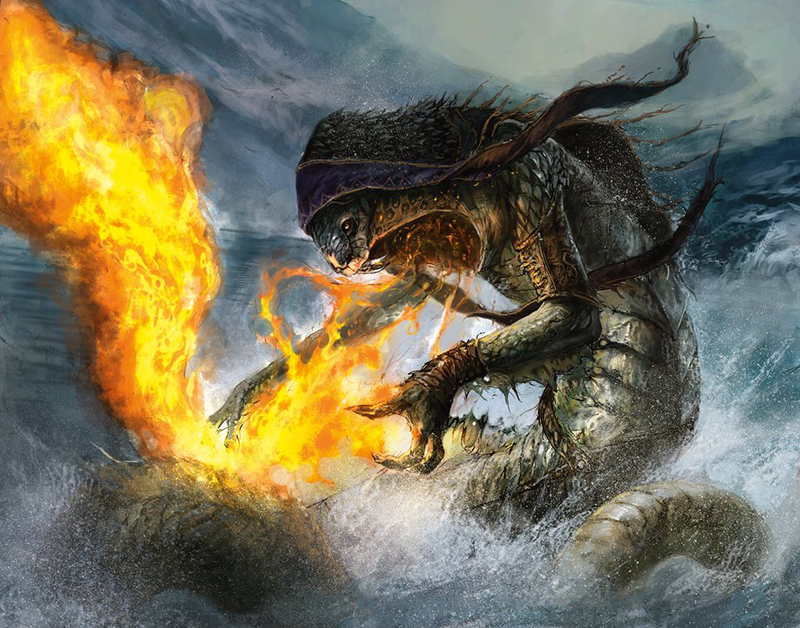 Chaos Draft is a format where almost any bad creature can serve a purpose, and if there’s one thing green is good at, it’s beefy bodies at common and uncommon. I was hesitant to start picking up green creatures without fixing, but once the pack gave me both Simic Guildgate and Woodland Stream, I was ready to take almost anything that came my way. Besides being a nice payoff for taking Temur Charm, splashing green allowed me to snag Tajuru Pathwarden, an absolute bomb in this context. 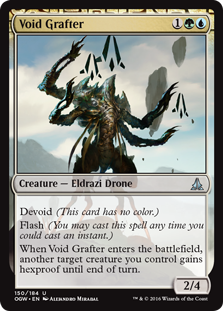 It also gave me more interaction in the form of Void Grafter and Wasteland Viper. Even more impactful, though, was that it turned on some actual bombs. 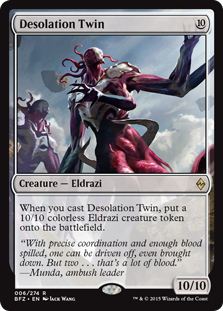 Pack 2 Pick 2 was Desolation Twin, a giant creature that I had little hope of casting until green gave me Seek the Horizon. In this Chaos Draft environment, casting a 10-mana creature was not a problem, and getting to make it a 12/10 unblockable with Taigam’s Strike, or sending an alpha attack with the third mode of Temur Charm was devastating. Finally, Pack 3 Pick 1 gave me Scourge of Skola Vale, which becomes difficult to deal with very quickly—particularly in a deck with multiple incidental X/4 creatures. 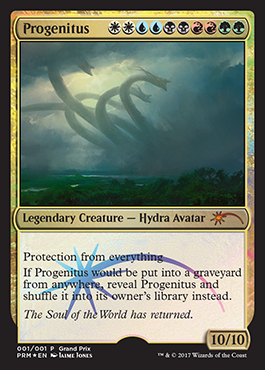 The Scourge made combat math tricky, since an opponent could waste a trick trying to kill my blocker, only to have that creature’s toughness get added to the Hydra, which would just block next time around, or attack for lethal. Chaos Draft may be a little silly. Or maybe a lot silly. But beyond the fun of playing with cards you’ve never played before, or in a different context, I think Chaos Draft is a legitimate way to exercise your card evaluation muscles. In a way, it takes me back to the prereleases of my youth, where you would know no more than a handful of cards, if any, before getting to the card shop for that midnight sealed event. Magic is a game where most of the game pieces are not exciting, and many of them seem outright bad. But is that actually the case for these specific game pieces in my hands in this specific time and place? How much am I willing to pay for an effect that can break through a board state where my opponent has equally bad game pieces? There are, of course, many ways you can approach a Chaos Draft, and by design, what works once may not work the next time. But here are some general tips that may help you guide your decisions next time you find yourself with a pod full of random packs. 1. If allowed, pick boosters that were designed to work together. 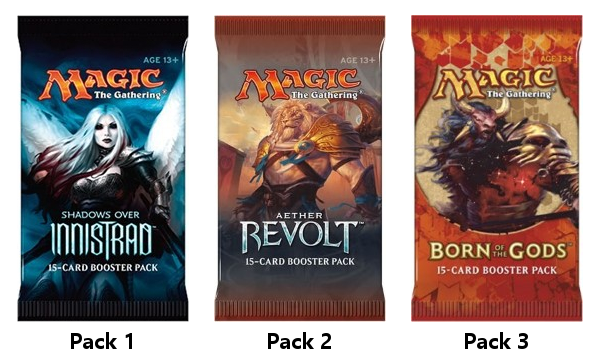 This is kind of a no-brainer, but if the draft allows you to bring your own packs (or the pod Rochester drafts the available boosters), give yourself a tiny leg up on the competition by selecting packs you know will have some synergy together. Don’t expect this to take you too far, though, since your first picks from these packs may be “bombs” that require you to pass on what little synergy you can expect to receive in the first place. 2. Read the card. Then read it again. Unless you are a long-time frequent drafter, you will be seeing unfamiliar cards during a Chaos Draft. Even if you are familiar, it may have been a number of years since you last played with any specific card. Avoid fatal play errors or mis-evaluations caused by not fully understanding what your cards do. On the other side of the table, you will also run into opponents who misunderstand what a card might do. Take the time to make sure you fully grasp what a card does before taking action, and catch your opponents when they play something incorrectly. 3. Prioritize creatures with evasion and bodies. This is still limited, and creature combat is more or less the only way to go when it comes to winning the game. In this kind of environment, a 3/3 with flying could very well win you the game if it goes unchecked. 4. Be aggressive if you can, but plan to go long. If you can swing in under your opponent’s plans, good. But don’t expect that to get you there every time. There will be games where your opponent answers your threats, and if they can drop a 4/4 that stops your creatures from advancing, you will be in big trouble. You need at least one or two late-game creatures and/or card draw. 5. Do not skip the fixing. It is important to remember that Chaos Draft by its nature does not typically feature heavy synergy. That means there are no established archetypes players will be gunning for. This will often lead to very bad signals, with players switching colors more frequently than a typical draft. If you pick up all the fixing, there is a better chance you have more playables than your opponent. Many players make the mistake of passing on fixing because it only taps for one of their colors, but in a format where you will be short “playables,” you will rarely be punished for taking more fixing. 6. Be ready to interact. Your options for interaction could be limited. 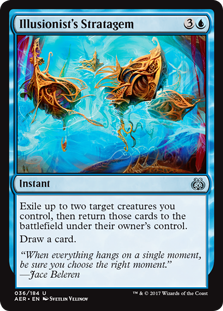 Unlike a typical draft environment, where you may get multiple pieces of on-color removal, Chaos Draft may force you to take a second look at interaction you may otherwise skip. 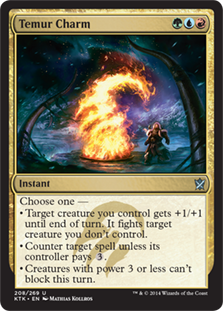 It might be correct to use offensive tricks like Brute Strength to save your creature on the defense, or blink your creatures with Illusionist’s Stratagem to get minor tempo advantage while blanking a removal spell. Maybe that 4-mana counterspell is worth running in the absence of something better. 7. Avoid the trap of evaluating cards based solely on prior experience. This is the primary challenge of Chaos Draft. Of course, certain cards will always be good. You’re not turning down a Glorybringer or the like. But most of the cards we typically call “draft chaff” have the possibility to fill a role in a new environment. Humans want to find the easy answer whenever possible. That’s just our nature. But don’t let yourself fall into a trap of ignoring the cards that might be right for your deck, simply because they were last-picks in their original limited environment. 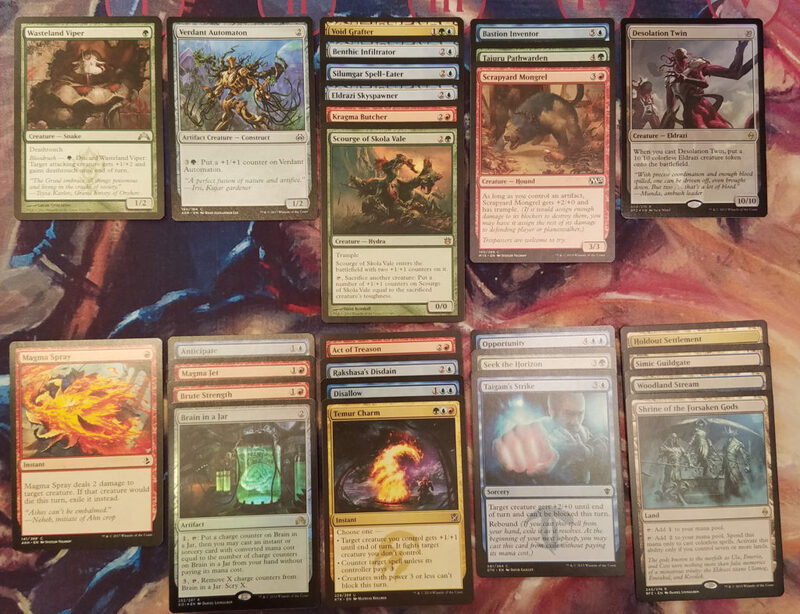 Now that I’ve shared my take on Chaos Draft, check out the full pool below. What do you think I got wrong? What would you change? I’d be interested to hear your thoughts in the comments below. Who knew Mana Leak on a 3/4 creature was totally worth 8 mana?